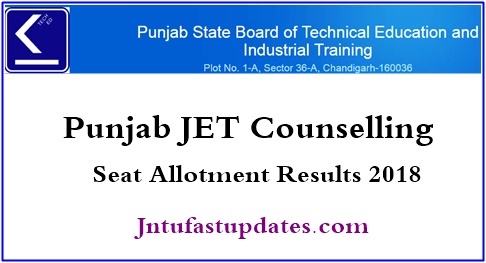 Punjab JET 2nd Counselling Seat Allotment Results 2018 : Punjab State Board of Technical Education and Industrial Training (PSBTE & IT) announced the JET 2nd/ Second round seat Counselling result today on 4th July for the applicants curiously waiting to get admission in Diploma Courses in the state of Punjab. Aspirants appeared for Joint Entrance Test (JET) examination in the state of Punjab and qualified the examination with good merit can check Punjab JET seat allotment (2nd round) from the official website, psbte.gov.in. Candidates allotted seat in 2nd round allotment will get admission into various Diploma courses for the academic year on 2018 -19 in affiliated colleges of PSBT & IT. Candidates who got the seat allotment in PSBTE Diploma colleges will have to attend the document verification round in the next phase. Candidates also have to pay the requisite processing fee to lock the seat. Finally, aspirants have to report at the allotted colleges within specifies dates. Punjab State Board of Technical Education and Industrial Training (PSBTE & IT) is the state level technical education board. The board offers affiliation to various Engineering/Diploma colleges in the state of Punjab. It is one of the largest entity of education in the Punjab state. Yearly, the PSBTE allots admission into various Engineering/Diploma courses for the students. The admission will be given purely on the basis of merit of the candidates. To offer admission the PSBTE organizes the Joint Entrance Test (JET) examination for the 12th/Plus 2 qualified aspirants. Every year, a large number of hopefuls are going to compete for the Punjab JET examination. The Punjab Technical Education Board has done with the choice filling process from 13th June to 18th June. Aspirants wishing to get admission in various Diploma courses have filled up their choices for colleges/courses during the period. The PSBTE is now ready to announce the PSBTE Diploma seat allotment result 2018 (2nd round) on today, 4th July at 5 PM. Aspirants can get ready to check the Punjab Diploma seat allotment list on PSBTE official portal, punjabteched.net. Candidates can check the Punjab Diploma seat allotment list from the PSBTE website mentioned above. The 2nd round seat allotment list will be open by the organization on July 4th at 5 PM. Stay checking the official portal. Candidates who got allotted the seat in 2nd round seat allotment can proceed with document verification and report at the allotted colleges. Candidates have to report at the allotted colleges between 5th t0 9th July. The third counselling starts from 13th July. The organization will declare the 2nd round seat allotment result on 4th July at 5 PM. And the candidates have to report at the allotted colleges between 4th July to 9th July. Check more details from the following. On the homepage, click on Punjab JET Diploma 2nd Round seat allotment result 2018 link. And make a printout of the Punjab JET seat allotment order to report at the allotted college.